As usual, now that the playoff seeds are set in the ECAC, we can take a look at the first round matchups and potential second round matchups (which are primarily what RPI fans are concerned with). Further playoff coverage to come during the week, but we wanted to get this up quickly for everyone's use. 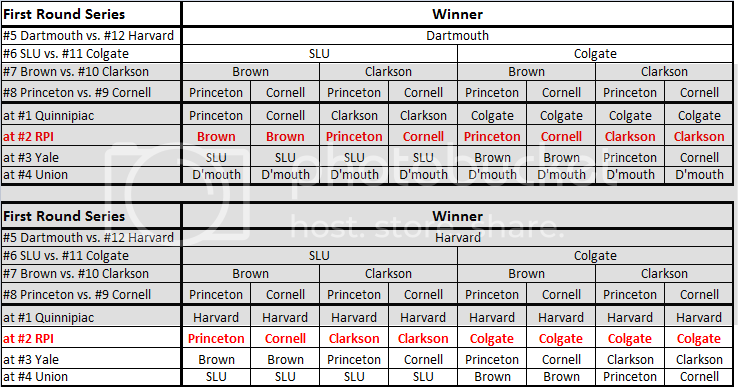 Dartmouth wins the tiebreaker with St. Lawrence for 5th on a superior record against the Top 4 of Quinnipiac, RPI, Yale, and Union. Brown wins the tiebreaker with Princeton for 7th on a 4-0 season series win. Cornell wins the tiebreaker with Clarkson for 9th on a superior record against the Top 4 (the difference, BTW, being Cornell's victory over RPI in Ithaca). * Dartmouth's first gig hosting in the first round since their 2009 series with RPI. They have not won a first-round series at home since 2007. * Harvard's first time ever finishing in last place in the ECAC. They won their last first-round series on the road, at Clarkson in 2011. They then lost at Dartmouth in 3 games in the quarterfinals. The Crimson had a first-round bye last year. * St. Lawrence's second straight season hosting a first round series. They were swept last year by Dartmouth. Their last home playoff series win was in 2010 over Clarkson. * Colgate's third bottom-four finish in five years. Their last was in 2011, when they upset RPI in the first round as the #12 seed. Each of their last four road playoff series have gone three games. * Brown's first home playoff series since 2005, a two-game sweep of RPI. * Clarkson's first road playoff series since 2010. They have not won a playoff series anywhere since 2007. * Princeton's third first round series at home in four years. They have lost four consecutive playoff series. * Cornell's first road playoff series and first round series since 2008, and the first time they will not have any home playoff games since 1999. Their first ever first-round bye. They have never lost a home playoff series in the ECAC, and have advanced past their opening playoff round in every year they've been in the league. First time with the first-round bye since 1997, under a different playoff format (the bye did not exist from 1998 to 2002). They have not won a home playoff series since 2004. Fourth first-round bye in five years. They have lost only one home playoff series since Keith Allain became head coach, falling to Brown in three games in 2010. Fourth consecutive first-round bye, and fifth in six years.